The beauty of this plant lies in its very attractive leaf shape and markings. In summer the leaf margins take on red and yellow hues. This plant is a much-branched, succulent, perennial shrublet. The stems are thin, fleshy near the growing tip, but rather woody lower down. Leaves are opposite, ovate and lanceolate in shape. Flowers are grouped in clusters at the apex (growing point). The flower colour ranges from deep pink to pale pink. Flowers are borne June to September. The seed is very fine, resembling dust. It is interesting to note that the green chlorophyll (green colouring) recedes deeper into the leaf tissue in the summer heat. In summer the leaf margins take on brilliant red and yellow hues. It is nature's way of surviving the dry summer heat. In most cases the plants rest in summer. The plants generally grow very slowly. This is especially the case where plants are cultivated from seed. Under ideal conditions it may take five years for a plant to reach a length of 1 m. They can live for more than sixty years in their natural habitat. Crassula rupestris is not threatened. 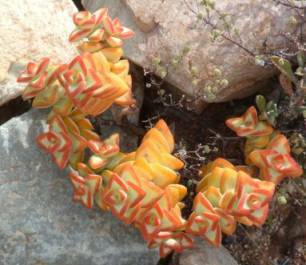 Crassula rupestris occurs in southern Namibia, the Richtersveld, Namaqualand Ceres Tanqua Karoo, Worcester Robertson Karoo and Little Karoo. It favours hot, dry, rocky habitats. Like so many of other succulent plants from the dry western parts of our country, they are water misers. They survive in predominately winter rainfall areas that receive little more than 120 mm annually. They are relatively frost tolerant, being able to survive temperatures of - 4°C. Crassula is from the Latin diminutive of crassus meaning thick and succulent. Crassulas have long been a favourite of European gardeners. Plants were collected in South Africa in the early 1700s and taken to England and Europe where they were grown in greenhouses. Rupestris means 'rock-loving', referring to its rocky habitat. There are approximately 200 species of Crassula world-wide, with most of the species occurring in South Africa. 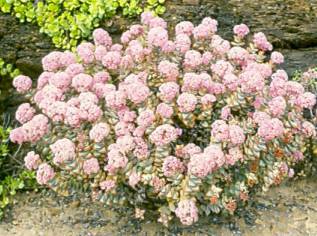 Crassula rupestris is pollinated by bees, bumble bees and sometimes even moths. The fine seeds are carried by the wind some distance away from the parent plant. They are blown into rocky crevices and under bushes where they will germinate once sufficient moisture is available. Out of the thousands of seeds that germinate, only a very small fraction will make it to adulthood. This can be accomplished either by cuttings or seed. If one wishes to propagate by cuttings, it is advisable to harvest material in early autumn (April, southern hemisphere). The reason for this is that the plant is probably at its driest. In horticultural terms this is ideal in that most of the sap has dropped and the plant can easily be struck (grown) as a cutting. Once the cutting is taken, allow it to "dry out" for one week. The cutting should be 100-150 mm in length. Ensure the cutting is healthy and not diseased. Use a sharp knife or high quality secateurs to take the cutting. Use sharp, good quality river sand to strike the cuttings. One can use low, intermittent misters. A misting four times a day in April should suffice. Ensure the area where the cuttings are placed to root, is well ventilated and there is enough natural light (approx 50%). The cuttings should, under the right conditions, root within two to three months. Rooting is a lot slower than in other Crassula species due to the woody growth of the plant. Plant out in one pint bags. Use sandy loam with very well-rotted compost. Move to a sunny location. By October/November the plants should be strong enough to be planted in a pot. Seeds are borne in September and October of each year (southern hemisphere). Collect the seed once ripe. The seeds are very fine. They almost resemble petunia or begonia seeds. Sow the seed in March/April/May. The seed must be sown on the soil surface. Do not bury the seed. The seeds are too fine for this and will battle to emerge though the thick blanket of soil. Rather scatter some coarsely sieved sand granules over the seed. These sand granules will prevent the seed from blowing away or being washed out when watering. The soil medium in the flat sowing pan must be well-drained loam. Keep moist and well ventilated. Give plenty of light. The seeds will germinate in two to four weeks. In most cases only plant these young seedlings out in April of the following year. Prick out carefully without damaging the roots and plant into one pint bags or 9 cm pots. Move to a sunny location. Fraser, J.L. & Hemsley, A. 1938. Johnson's garden dictionary. De La Mare, London. Goldblatt, P. & Manning, J. 2000. Cape plants. A conspectus of the Cape flora of South Africa. Strelitzia 9. National Botanical Institute, Cape Town.